Various electric cars on display including the Chevy Bolt, Nissan LEAF, and Tesla. Wind power, a closer look at energy storage, electric cars... and a big announcement! Co-hosted by Mass Energy, Craig Van Batenburg of ACDC Hybrid and Electric Vehicle Training & Resources, and friends. 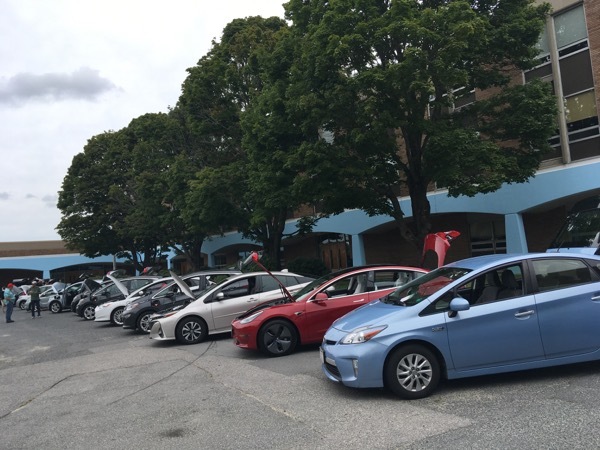 Mass Energy is changing its name... and what better way to unveil it and to celebrate National Drive Electric Week than with one of our famous clean energy tours? Electric vehicle "teach in" with Criag Van Batenburg - Did you know a used EV sells for less than $10,000? New EVs go over 200 miles on one charge? The US Government (may change soon) has rebates up to $7,500 and Massachusetts will send you a check for $2,500. Registered attendees report 256,195 electric miles driven.